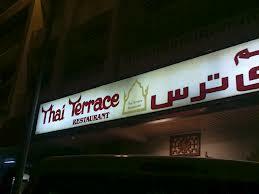 Thai Terrace is another restaurant with outdoor and indoor seating facility that serves traditional Thai cuisine in Dubai. This cozy restaurant is located in the region of Al Karama where guests will certainly feel the warmth of living room, when the courteous staff welcomes them in this wonderful restaurant. Despite being located among several indie restaurants, Thai Terrace has been able to register its strong presence because of fantastic Thai food, prompt service and low prices. These attributes are hard to find nowadays therefore, this flamboyant eatery not only attracts several locals but foodies from other corners of the city as well. Thai Terrace is a dedicated Thai restaurant where regional delicacies of Thailand are cooked with the finest ingredients and traditional recipes. Its menu includes varieties like spicy fish cakes, array of curries, soups, salads, noodles and much more. Guests can wash these scrumptious dishes with delightful jasmine tea to feel at ease, even if a person is filled till collar. In addition to this, carry out service is also available so people can opt for it as well, apart from dining in. To see the delectable dishes of Thai Terrace Restaurant, click here! This restaurant opens in the noon and shuts down its operations around 11:30 pm. Timings remain same on all seven days of the week. Across from Spinneys, Karama, 2B Street Trade Centre Road, Dubai, United Arab Emirates. 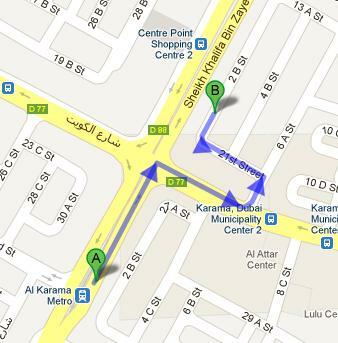 Al Karama Metro Station 1 is 800 meters away from the Thai Terrace Restaurant. By walk this distance can be bridged in about 10 minutes. If a patron heads in the northeast direction on شارع الشيخ خليفة بن زايد‎/D 88 towards Kuwait Road from this metro station and then turn right onto Kuwait Road. After that patron should turn left onto 6 A Street, then make another left turn that goes onto 21st Street. Karama, Dubai Municipality Center 2 – Dubai bus stop is 350 meters away and 4 minutes walking journey from the Thai Terrace restaurant in Al Karama. Bus numbers 88, 91, C14, C15 and C26 serve this bus station. So visitors of Thai Terrace restaurant can use any of them to get to it. After reaching this bus station they should head in the west course on Kuwait Road, then turn right onto 6 A Street and afterwards make a left turn onto 21st Street. The 21st Street will then turns slight right and become 2 B Street and destination can be easily found on this lane. See map for directions.